Garfinkel D, et al. Feasibility Study of a Systematic Approach for Discontinuation of Multiple Medications in Older Adults. Arch Intern Med. 2010;170:1648-54. Background: Polypharmacy and inappropriate medication use is a problem in elderly patients, who are more likely to experience adverse effects from multiple treatments and less likely to obtain the same therapeutic benefit as younger populations. The Good Palliative Geriatric Practice algorithm for drug discontinuation has been shown to be effective in reducing polypharmacy and improving mortality and morbidity in nursing home inpatients. This study reports the feasibility of this approach in community-dwelling older patients. Methods: The Good Palliative-Geriatric Practice algorithm was applied to a cohort of 70 community dwelling older patients to recommend drug discontinuations. Success rates of discontinuation, morbidity, mortality, and changes in health status were recorded. drug therapies, 2% were restarted because of recurrence of the original indication. Taking nonconsent and failures together, successful discontinuation was achieved in 81%. Ten elderly patients (14%) died after a mean follow-up of 13 months,with the mean age at death of 89 years. No significant adverse events or deaths were attributable to discontinuation, and 88% of patients reported global improvement in health. would be suitable for larger randomized controlled trials in different clinical settings. We usually examine the patients with stroke, hypertension, diabetes, atrial fibrillation, and so on. When we examine such as patients, we evaluate risk of ischemic stroke. For example,when we examine the patients with atrial fibrillation, we evaluate CHADS2 score and consider whether we should prescribe anticoagulants. I found this article about the predicting risk of ischemic stroke in primary care. I read it. Objective :To develop and validate a risk algorithm (QStroke) to estimate risk of stroke or transient ischaemic attack in patients without prior stroke or transient ischaemic attack at baseline; to compare (a) QStroke with CHADS2 and CHA2DS2VASc scores in patients with atrial fibrillation and (b) the performance of QStroke with the Framingham stroke score in the full population free of stroke or transient ischaemic attack. Design :Prospective open cohort study using routinely collected data from general practice during the study period 1 January 1998 to 1 August 2012. Setting :451 general practices in England and Wales contributing to the national QResearch database to develop the algorithm and 225 different QResearch practices to validate the algorithm. Participants :3.5 million patients aged 25-84 years with 24.8 million person years in the derivation cohort who experienced 77 578 stroke events. 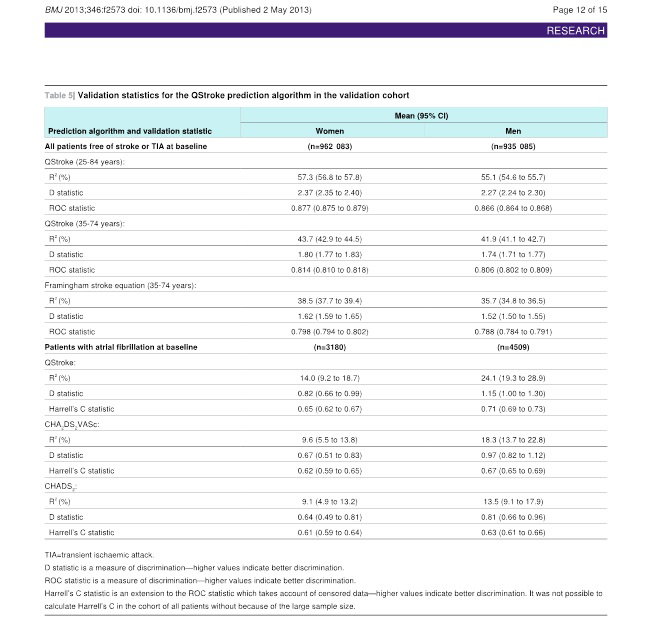 For the validation cohort, we identified 1.9 million patients aged 25-84 years with 12.7 million person years who experienced 38 404 stroke events. We excluded patients with a prior diagnosis of stroke or transient ischaemic attack and those prescribed oral anticoagulants at study entry. Main outcome measures :Incident diagnosis of stroke or transient ischaemic attack recorded in general practice records or linked death certificates during follow-up. Results :The QStroke algorithm explained 57% of the variation in women and 55% in men without a prior stroke. The D statistic for QStroke was 2.4 in women and 2.3 in men. QStroke had improved performance on all measures of discrimination and calibration compared with the Framingham score in patients without a prior stroke. Among patients with atrial fibrillation, levels of discrimination were lower, but QStroke had some improved performance on all measures of discrimination compared with CHADS2 and CHA2DS2VASc. Conclusion :QStroke provides a valid measure of absolute stroke risk in the general population of patients free of stroke or transient ischaemic attack as shown by its performance in a separate validation cohort. QStroke also shows some improvement on current risk scoring methods, CHADS2 and CHA2DS2VASc, for the subset of patients with atrial fibrillation for whom anticoagulation may be required. Further research is needed to evaluate the cost effectiveness of using these algorithms in primary care.